Warm up this January and make Joe Wicks' Toad in the Hole recipe from his new book, Cooking for Family and Friends. 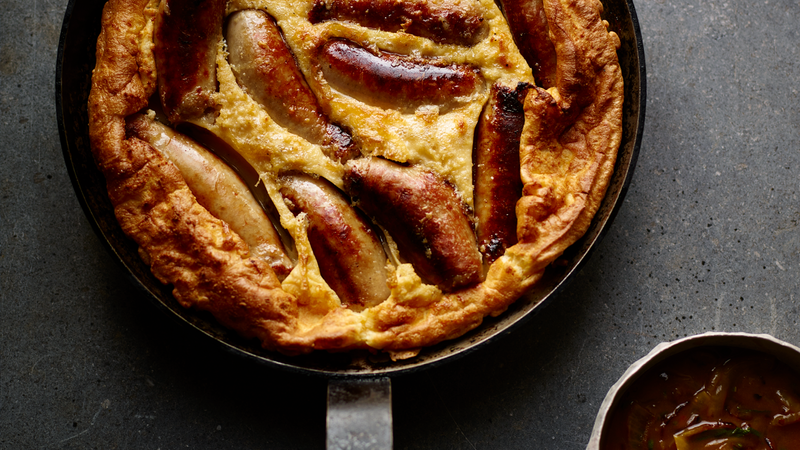 Warm up this January by making Joe Wicks' Toad in the Hole recipe from his new book, Cooking for Family and Friends. 1. Beat the eggs and the milk together, adding a little salt as you whisk. Tip the flour into a bowl and make a small well in the middle. Pour in the milk-and-egg mixture. Use a whisk to gently combine until you end up with a perfectly smooth batter. Leave to stand while you prepare the rest of the ingredients. 2. Preheat your oven to 210ºC (fan 190℃/gas mark 6). Pour 2 tablespoons of the oil into the baking dish or ovenproof skillet and slide it into the oven to heat up for at least 10 minutes. 3. Meanwhile, pour ½ tablespoon of the oil into a frying pan over a medium to high heat. Add the sausages and briefly brown them all over – it isn’t necessary to cook them through at this point because they will finish cooking in the oven. 4. By now the oil in the baking dish should be piping hot so carefully remove the dish from the oven and, working quickly and carefully, lay the browned sausages into the dish. Give the batter one last whisk, then pour it over the top of the sausages before quickly sliding the dish back into the oven. Bake the toad in the hole for 35 minutes. 5. Meanwhile, make the onion gravy by heating up 1/2 tablespoon of oil in a saucepan over a medium heat and adding the sliced onion. Sprinkle in a pinch of salt and cook the onion slowly for about 10 minutes, stirring regularly, until very soft and lightly browned. 6. Stir in the sage leaves and the flour and, stirring almost constantly, cook for 45 seconds before adding the splash of vinegar, boiling it until it has almost disappeared. Gradually pour in the stock, stirring it well before adding more, to avoid lumps in the gravy. When all the stock is in the pan, bring the gravy to the boil and then keep it warm until you are ready to eat. 7. After 35 minutes, the toad in the hole should have risen beautifully. Take it straight to the table with the gravy, and some steamed greens, and show it off to your mates. Cooking for Family and Friends by bestselling author and trainer Joe Wicks, aka The Body Coach, has over 100 recipes that you can share with family and friends. All of the recipes in the book are organised into reduced-carb and post workout chapters, just like Joe's first three Lean in 15 cookbooks. This makes it a brilliant addition for those already familiar with Joe's eating structure (carbs following workouts or on active days) but the meals are also enjoyable and tasty for all, whether you are following Joe's plan or not.